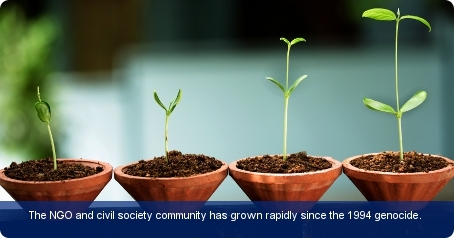 The NGO and civil society community has grown rapidly since the 1994 genocide. In the immediate period following the genocide, most NGOs concentrated their activities on emergency relief and welfare; a number of organisations for instance were created for widows and orphans. Organisations such as Save the Children were involved in tracing parents and relatives of children who became separated during the genocide. The NGO community had huge influence during this period, sharing some of the public service delivery with local government. Today many of the activities of NGOs have evolved to include other forms of development such as environmental sustainability, gender awareness and health. The country continues to receive substantial levels of aid, a sizeable portion of which is channelled through numerous local and international NGO projects. The government acknowledges the important role that NGOs have played in the reconstruction of the country and in giving humanitarian aid to its citizens. To acquire legal status, NGOs must register with the Ministry of Local Government and the Ministry of Justice. Rwanda has strong bilateral relationships with various countries including the UK, the USA and South Africa and is now in its third year of being a part of the Commonwealth. Rwanda’s trade unions are represented by the Centrale des Sybndicats des Travailleurs du Rwanda (CESTRAR) and must register with the Ministry of Justice to be officially recognised. With the exception of civil servants and state officials, all workers can be a part of the trade unions.